Penns in the Rocks is an early 18th Century redbrick house, built for the family of William Penn of Pennsylvania. The house is set oposite a natural outcrop of monumental sandstone rocks, and in the 20th Century was home to Dorothy Wellesley, the Bloomsbury poet and friend of WB Yeates. She erected the temple which faces the front of the house, and which is dedicated to "The poets who loved Penns". In 1956, after her death, Penns was acquired by the Gibson family, who live there still. The late Lord Gibson was Chairman of the Arts Council, and of the National Trust. 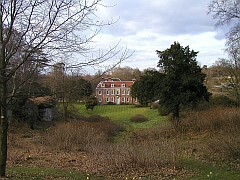 He and Lady Gibson remodelled the interior of the house, and with the help of Lanning Roper adapted the garden from Dorothy Wellesley's original design.